When you’re about to embark on a major project, you want to be able to see how the engineering design will come together on the factory floor. Planning for a new production line typically involves the selecting individual equipment – such as fillers, labellers and palletisers, without really knowing how the machines will work together efficiently and effectively. Our team understands regulations and clearances, and we’re experts at space minimisation. We provide you with detailed plans and layouts as standard, however, a 3D animation is where it all comes to life. 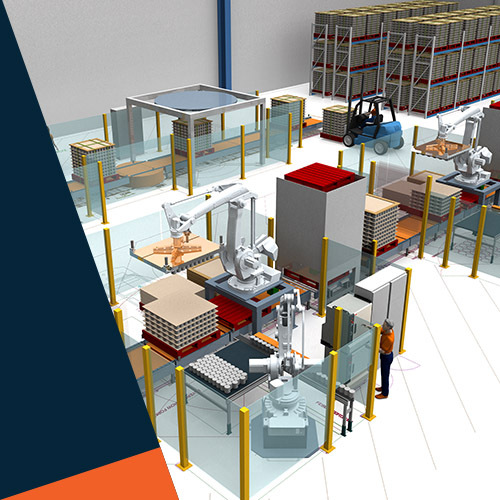 Foodmach’s 3D Line Simulation software turns traditional 2D plant layouts into a 3D visualisation and full simulation of what will actually happen. This ‘proof of concept’ testing identifies potential bottlenecks and rate-limiting processes in the production line. It also highlights safety issues around space allocation, for both humans and moving equipment such as forklifts. Seeing how your factory will operate in animated 3D ensures there are none of those glaring oversights that ruin projects and reputations.